She was named Best Young Actor/Actress on Sunday night at the Critics Choice Awards. 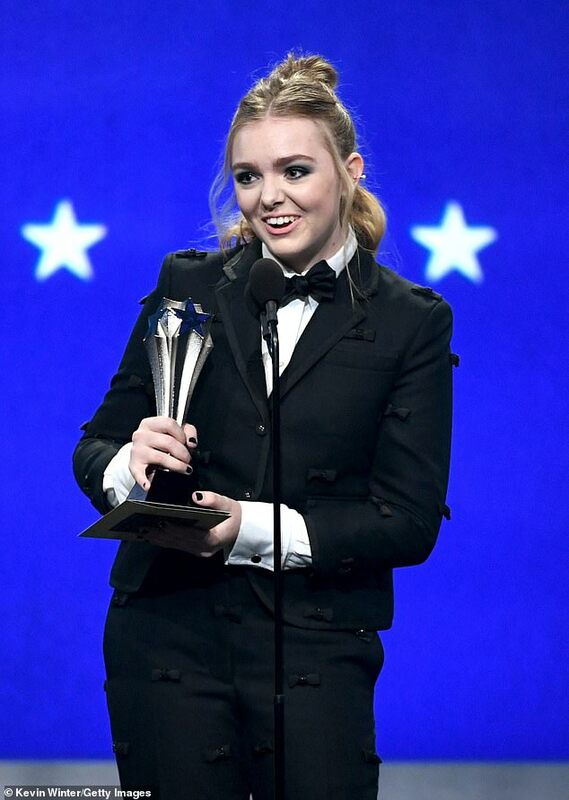 And 15-year-old Elsie Fisher couldn’t contain her excitement at the award which came for her performance in the independent film Eighth Grade. The teen has been garnering plenty of awards buzz but this is her first major win. Elsie showcased her quirky style as she arrived at the awards show, held in Santa Monica, California. She wore a black trouser suit dotted with small black bows and added a white cotton shirt and black bow tie. She stepped out in black patent lace-up shoes and carried a small black purse. The young actress wore her blonde hair tied back from her face and sported dramatic eye makeup. In Eighth Grade, directed by comedian Bo Burnham, she plays a 13-year-old living through her last week at middle school and feeling adolescent anxiety about moving to high school. While the part has gotten her noticed, she’s already got several film and TV credits to her name. She had a part in the 2010 film Dirty Girl and the 2015 drama McFarland, USA.